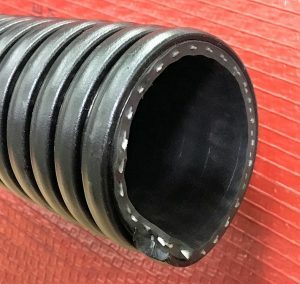 Type 9914 WeatherFlex Ultra Suction Hose is similar in style to our WeatherFlex type 9904 with the addition of a textile braid embedded in the rubber wall. This hose has a smooth EPDM rubber tube and a corrugated black polyethylene outer helix. The textile braid allows for a higher working pressure rating while maintaining excellent flexibility and durability. Recommended for water and liquid waste suction and discharge applications, where higher working pressure or a heavier wall is desired. WARNING: This product contains a chemical known to the State of California to cause cancer, birth defects or other reproductive harm. Do not use in connection with drinking water. Wash hands after handling. Visit www.P65warnings.ca.gov for additional information.